To understand how the query trees are displayed inside the Search Profiler, let’s look at a more complicated query. 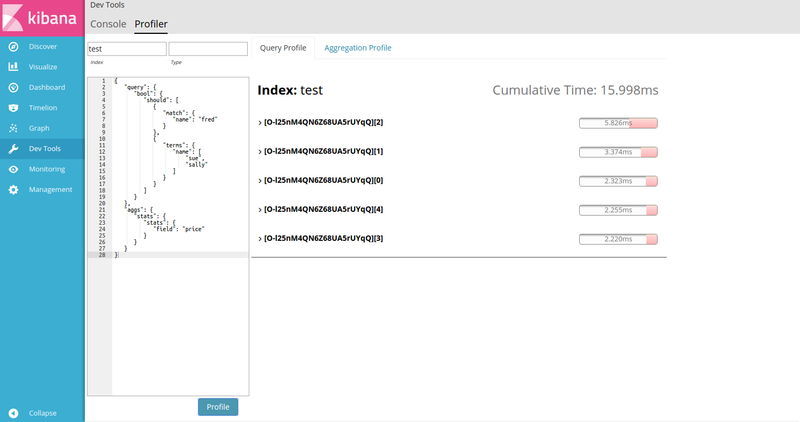 Enter "test" in the Index filter above the query editor (the input box with a grayed-out _all). This restricts profiled queries to the test index. Replace the default match_all query with a query that has two sub-query components and includes a simple aggregation. For example, copy and paste the following query into the query editor. Click Profile to profile the query and visualize the results. As before, you’ll see a list of shards appear in the center panel. You’ll notice that the query was slightly slower (15ms vs 0.13ms) because it actually had to do a bit of work this time, unlike the match_all query. Click the first shard’s Expand button to view the query details. The top-level BooleanQuery component corresponds to the bool in the query. The second BooleanQuery corresponds to the terms query, which is internally converted to a Boolean of should clauses. It has two child queries that correspond to "sue" and "sally" from the terms query. The TermQuery that’s labeled with "name:fred" corresponds to match: fred in the query. If you look at the timings, you can see that "Self Time" and "Total Time" are no longer identical on all the rows. Self time represents how long the query component took to execute. Total time is the time a query component and all its children took to execute. Therefore, queries like the Boolean queries often have larger Total than Self.